This entry was posted on August 31, 2011 at 10:22 pm and is filed under August 2011. You can subscribe via RSS 2.0 feed to this post's comments. 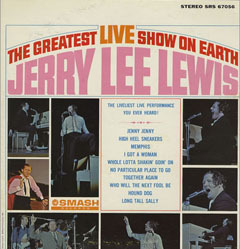 Ran across you blog regarding Jerry Lee Lewis “Greatest Live Show On Earth” recording. The correct date for the recording was July 18, 1964 (a Saturday night) and not July 1, 1964. The liner notes on the album by long time DJ Joe Rumore was incorrect. Also, that same night SMASH records also recorded Pete Drake’s performance which was never released.